Time for another SFR Brigade Presents snippet of the week! Here’s a brief section from the opening of my short story, Devil, Devil , that includes strong elements of romance in a classic time travel adventure. So abandon all sanity, ye who enter here–for Devil, Devil is a tale told by a madman! Devil, devil. I used to be a devil. That was my job, my calling, my pride. Of course, no one thought of me as a devil, but as a Voice. I’m the only one — my secret! — who knows the difference. Devil, not Voice. Why am I no longer one of the chosen few, the heroic time travellers, the Voices? I’ll tell you. Brought low by a woman. Oldest story in the world. Adam and Eve. Samson and Delilah. Devil, Devil was published a decade ago in On Spec, the Canadian Science Fiction magazine. Can you pick out the Canadian/British spelling in the excerpt above? Is a rather subtle difference from U.S. spelling, but it’s there. Tell me your guess in the comments section, and I’ll tell you if you’re right. 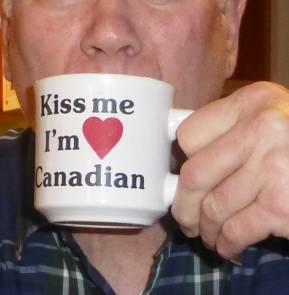 The first person to get it right wins (trumpet fanfare ) … an enlarged, signed hardcopy picture of Mr. Valentine drinking from his old “Kiss Me I’m Canadian” mug. Or, if the very thought of owning such a picture is so overwhelming that you fear your heart might stop (From delight or horror? Hmm) you can have my undying admiration, instead. What does The SFR Brigade Presents mean? The SFR Brigade is a world-wide, online community of science fiction romance authors, and Mr. Valentine is a proud member. Other members include Catherine Asaro, Eva Caye, Imogene Nix, Isabo Kelly, Jessica Subject, Linnea Sinclair, Lyla Bardan, and Sarah Shade. When you’re browsing for a good science fiction romance, check it out on the web or on Facebook. The Presents part deals with a blog hop a bunch of us are taking part in by posting brief snippets from either a published work or a work in progress. Be sure to check out other writers’ snippets! ‘Travellers’ has the Canadian/British spelling. =D I want to know why he’s no longer one of the chosen few too. And we have a winner! You have my undying admiration, if you want it. Ah, too late. I got the answer, also. I want to know what a Voice is. There’s no shame in being second, Greta.